[SURVEY] What are you interested in? Hello there! Long time no see ain't it? 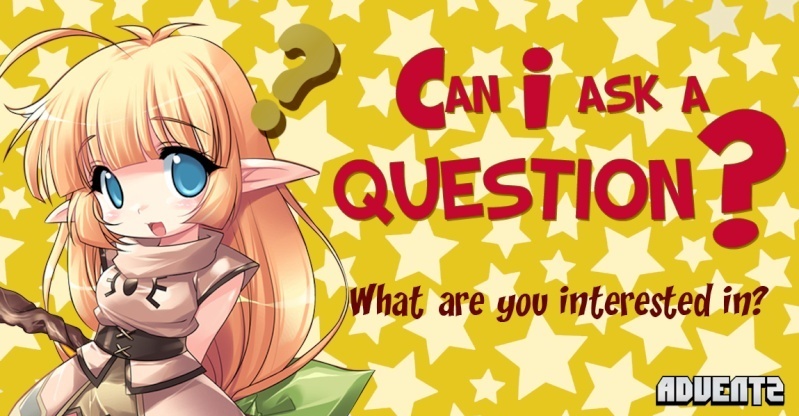 Today me and the rest of the AdventZ Staff just wants to ask you guys a simple question, that is - What are you interested in? We wanted to know what makes you excited, and what makes your heart go crazy. As you may have noticed, AdventZ have been down for already a long time, and we wanted to bring it back as per request, and also as per our will also. We wanted to serve you more, we wanted to make our fans stay up to date to the things that they are most interested in. In a few weeks time from now or within a maximum of two months, because we are not yet sure on when is the exact date we will be live once again, we officially tease you that we will be back soon enough. Of course on top of that our big comeback will resume, furthermore events will take place, unfinished business will be finally taken care of (thank you for your patience, you know who you are). That is simply why we are asking you. What are the things you are most interested in? Generally, we wanted to know because we are planning to expand our coverage from simply gaming up to animation, console gaming, to online gaming. What are the Online Games you're currently playing? What are the Animes that you are watching? What are the Console Games that you are eyeing for? If you have ideas other than Online Games, Console Games, and Animation that you want us to support kindly mention. Each of your answers will be added as an answer in the poll so that other people will be able to vote. We are looking forward on hearing from you. We are thinking off rewards for those who will cooperate. Re: [SURVEY] What are you interested in? Well, the only 2 things that I play online are Grand Chase and Elsword. I rarely watch anime. The last anime that I've watched is Fairy Tail. and these are the games I'm mentioning for now. How about upcoming movies. We could show them some teasers or trailers and tell something about it. I also wanted discussions about video games that we used to play in our childhood from the Nintendo Entertainment System (NES) to the present gaming consoles. Discussions like what are the good and bad memories you had in that certain game. also I will be taking a look on the list of console games that you've provided. also you might want to include the platform of those games also..